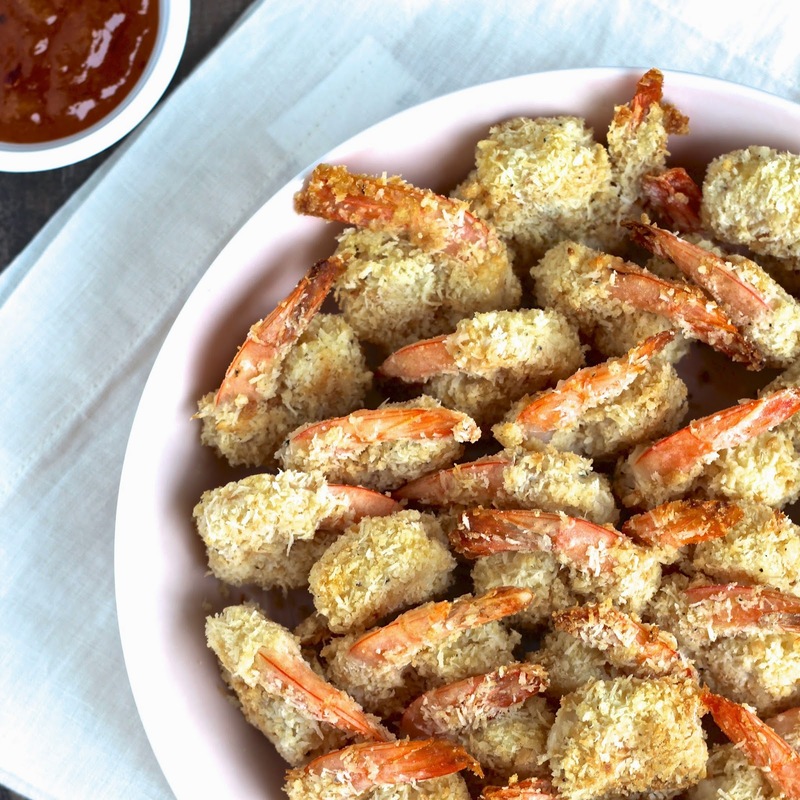 These healthy, gluten-free coconut shrimp are baked instead of fried and are perfect for entertaining guests! Have you ever had to whip up a quick dish or meal for last minute guests? It’s always good to have one or two go-to recipes under your belt for those days. I had an impromptu cocktail party the other night and needed a delicious and fun appetizer that would appeal to everyone and wouldn’t take too much time to prepare. After a quick search through my pantry and freezer, I decided to go with coconut shrimp. They’re the perfect appetizer for entertaining- they’re easy to pick up, you can eat them in one bite and most importantly, they taste great! 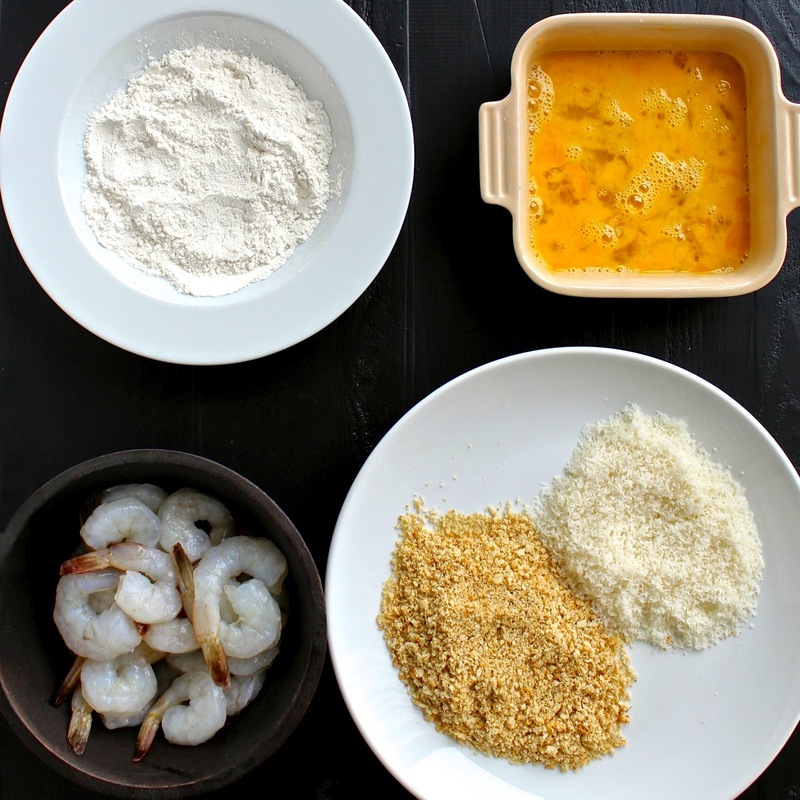 The coating for coconut shrimp is usually made with a mixture of breadcrumbs and shredded coconut. Instead of using breadcrumbs, I decided to use Breton crackers. Made with all natural, wholesome ingredients, Breton crackers are very versatile- they’re great for serving at parties or just for everyday snacking. They have a nice crispy texture and come in a variety of flavors- even my toddler enjoys snacking on them. The folks at Breton sent me four types of their gluten free crackers to sample. All of them were delicious and all are certified gluten-free by the National Foundation for Celiac Awareness Gluten-Free Certification Program. I used the White Bean with Salt & Pepper Crackers, which are made mainly from navy beans. Each serving contains two grams of fiber and two grams of protein. They’re also low in saturated fat, contain no artificial colors or flavors, no cholesterol and are trans-fat free. combination of the ground crackers and shredded coconut worked perfectly to coat the shrimp after a quick dip in some gluten-free flour and eggs. Instead of using sweetened coconut like many recipes do, I used natural, unsweetened coconut and paired the shrimp with a sweet sauce made with apricot preserves. Traditionally coconut shrimp are deep-fried but I baked mine in the oven instead. Rather than slaving over a hot stove frying batches of shrimp, I simply popped them in the oven and finished getting ready for my party. Don’t worry, you’ll still get a light, crispy, golden exterior with the oven-baked method and it’s a whole lot healthier! Needless to say my guests loved the dish and everyone wanted the recipe! The only thing I’ll change the next time I make this dish will be to double the recipe because the shrimp were gone in a flash. Plus, if you do have any leftovers, you can always freeze them and pop them in the oven to reheat for a quick and easy weeknight dinner. Enjoy! Place the crackers in a food processor and process until they are ground into crumbs. Alternatively, you can place the crackers in a resealable plastic bag and crush them with a rolling pin. Set up a breading station. Place the flour in a shallow dish. Whisk the eggs together in a second dish. Mix the crushed crackers, coconut and oil together in a third dish, distributing the oil throughout the mixture. Season the shrimp with a couple of pinches of salt and pepper. Working in batches, dip the shrimp in the flour. Shake off the excess flour and then dip them in the egg. Finally, dredge them in the cracker/coconut mixture, pressing the mixture onto the shrimp so that it adheres. Place the shrimp in a single layer on one or two baking sheets lined with parchment paper or sprayed with cooking spray. Bake, turning once halfway through, until shrimp are cooked and topping is golden, 15-16 minutes. While the shrimp are in the oven, heat the apricot preserves, vinegar and chili flakes in a small saucepan over medium-low heat. Cook a few minutes until preserves are melted. Serve shrimp with apricot dipping sauce. Nutrition information is for about 4 shrimp with 1 tablespoon sauce. I love coconut shrimp! These look so good. Pinning to make at my next party! Love this recipe! My mom is on a low-gluten diet so will make these soon. I have not seen these crackers but will look for them at the store! I'm so sorry Ben! I feel terrible for making your life so difficult 😉 On a side note, I couldn't agree with you more about greasy, fried shrimp…no bueno! Yum!!! How creative 🙂 These look so delicious! Delicious! Your recipes always look so good. That is such a great idea to use the bean crackers for the extra fiber and protein! 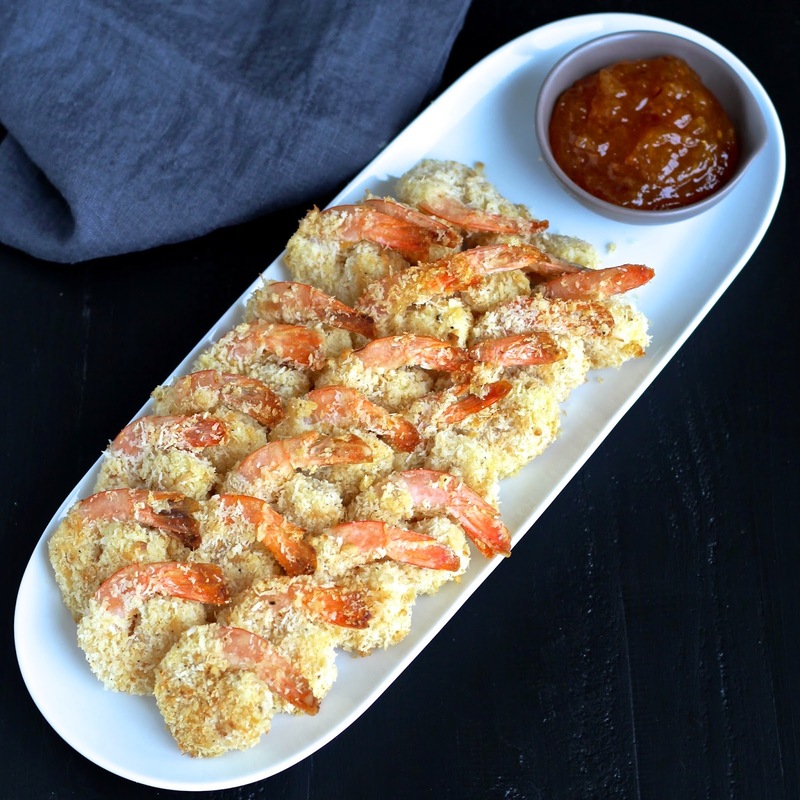 Sonali – what a GREAT idea to use Breton crackers and coconut to coat these shrimp! Lucky guests! But I am obsessed with how you used them — this dish looks incredible and right up my seafood-loving alley! Thanks so much Meme! A crumb topping sounds yummy! Sonali, open up a restaurant already. Haha! How about going into business together? 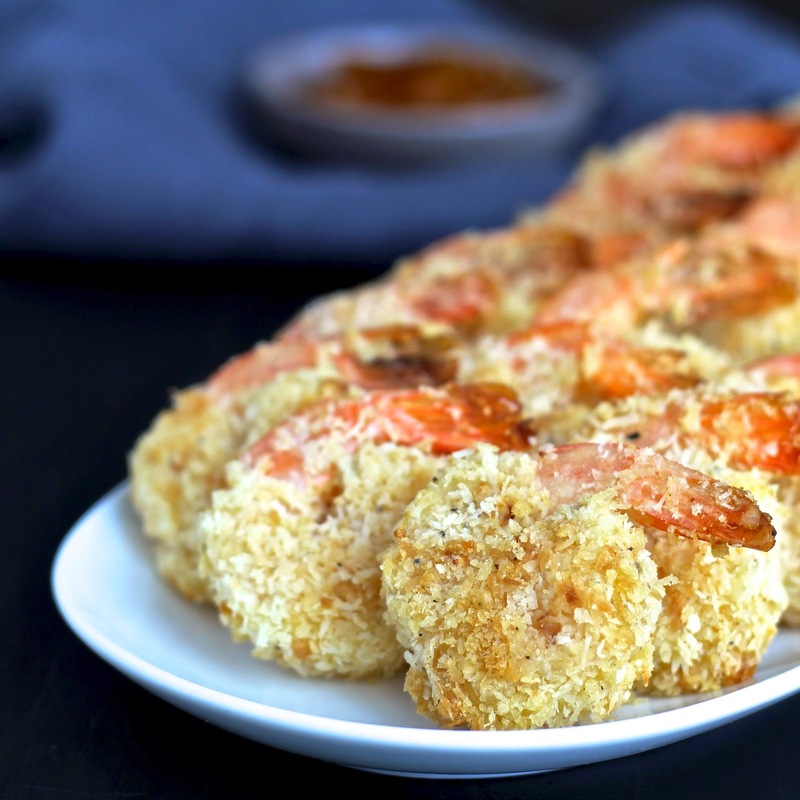 Personally I don't eat shrimp, but love that you baked these instead of frying and that Sweet and Spicy Apricot Dipping Sauce sounds phenomenal – definitely will have to make that for my baked chicken fingers! 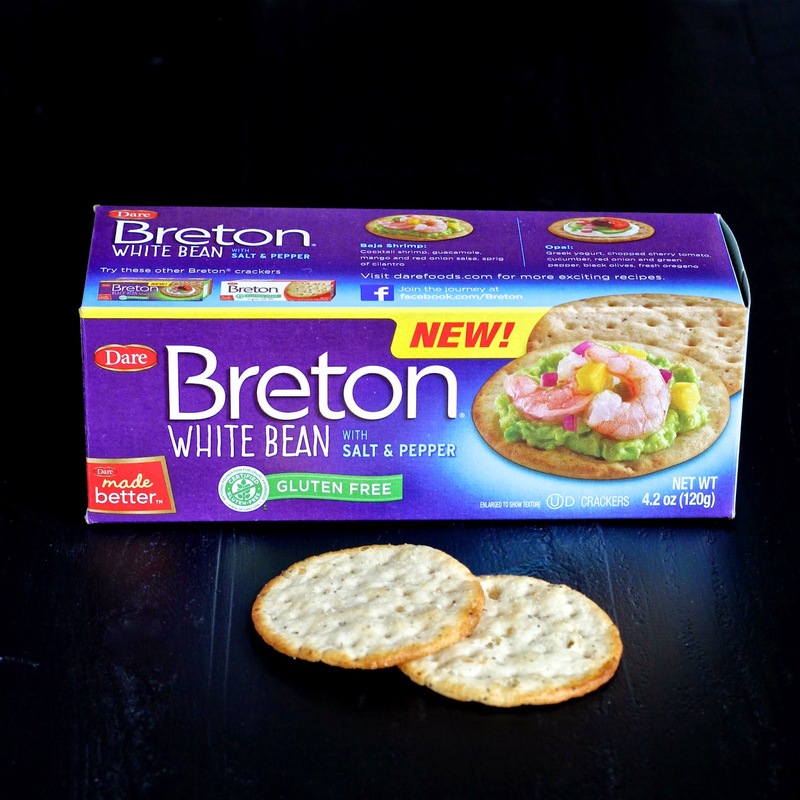 I've had some of the Breton GF crackers and they are really good. Excited to see they have some new flavors in the lineup! Thanks Jessica! The sauce is really yummy and having it with some chicken fingers sounds like an awesome idea! Oh man, if coconut scallops happen, given me a call and I'll be there in a flash!! I love shrimp and am always looking for another method of preparation. Thanks for sharing! I love shrimp in so many dishes and this looks absolutely delicious. I'd have to hold back from eating the whole plate of them! Thanks Anu! This means so much especially from someone who doesn't eat shrimp! This is such a simple and delicious idea! Love shrimp. Pinning to try it!